RED WING, MN (July 23, 2014) — Julie Malyon, a nurse and director of a free medical clinic, was curious about the expression on her dad’s face when she returned from the Women Ministries Triennial last year and told him she had learned about a wonderful ministry called the Paul Carlson Partnership. She explained that she wanted to help their work in the Democratic Republic of the Congo and that she planned to travel with a group of medical personnel from the Covenant to the impoverished African nation. Dr. Jim Walker and Julie Malyon at Paul Carlson’s grave in Congo. “I asked him about his reaction because I could tell there was more there than what I had just told him,” she says. Then her father, Jim Walker, a physician, told her a story. It was the martyrdom of Covenant missionary Paul Carlson in the Congo, Walker explained, that inspired him to go into medicine and to use his skills to serve the poor. That moment led to father and daughter working alongside each other treating patients and educating doctors at a hospital in Congo earlier this year. It was the first time they had worked together professionally. 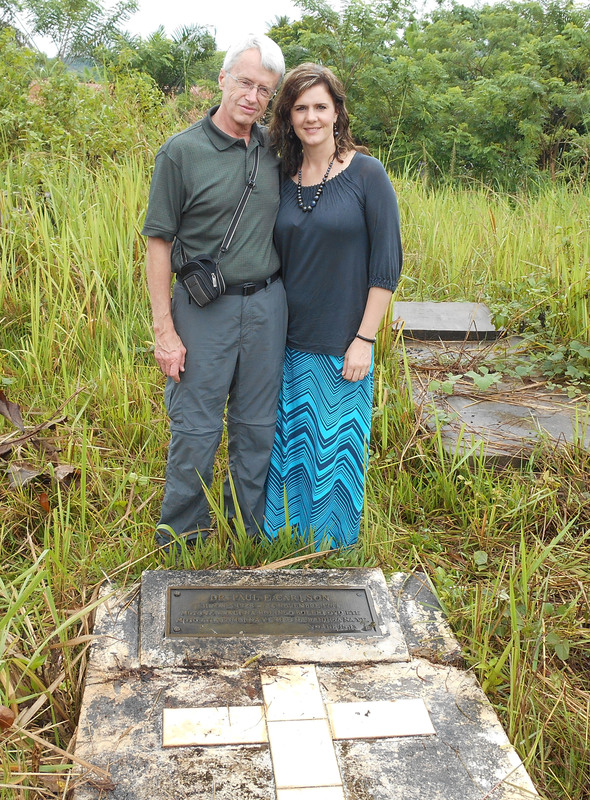 While in medical school, Walker and his wife, Patti, spent three months in the African nation of Cameroon. “We felt that the biggest lesson God taught us then was that missions is an attitude not a place,” he says. For the past 37 years the family physician has treated patients in Menomonie. That work included founding a free clinic and serving on short-term mission trips. For more than 20 years, Malyon, a member of First Covenant Church in Red Wing, had sensed that God wanted her to keep an open mind about serving in Africa. When she heard about PCP at the Triennial, Malyon left the event excited that the time had arrived. So earlier this year they traveled with a group of PCP medical ambassadors to Congo on a fact-finding and training trip at several clinics and the hospital in Karawa operated by the Congo Covenant Church. They processed what Walker kept calling the “incomprehensible” poverty, medical needs, and lack of access to care. People were dying regularly from conditions that are easily treated in the United States. They did save lives while there, but just as important, they taught life-saving skills to Congolese medical personnel, who have since been able to train others. Women and children who once would have died are now alive because of that training. Malyon and Walker are now committed to getting other medical personnel to help PCP improve the Congo Covenant Church’s system of hospitals and clinics, by far the largest one in Equateur Province, by becoming medical ambassadors. Malyon emphasizes that the medical personnel don’t need to travel to Congo, but their participation in a specialty focus group will help PCP consider how to help develop the best possible care. “If you got involved in a focus group, you could change the life of a whole people,” said Malyon, who chairs the nursing focus group. They also hope to encourage churches to participate in the Congo Clinic Initiative, which pairs churches with an individual clinic or hospital. A friend once said Walker’s greatest accomplishment was getting the free clinic started. Posted in Congo health, Medical Ambassadors, News.